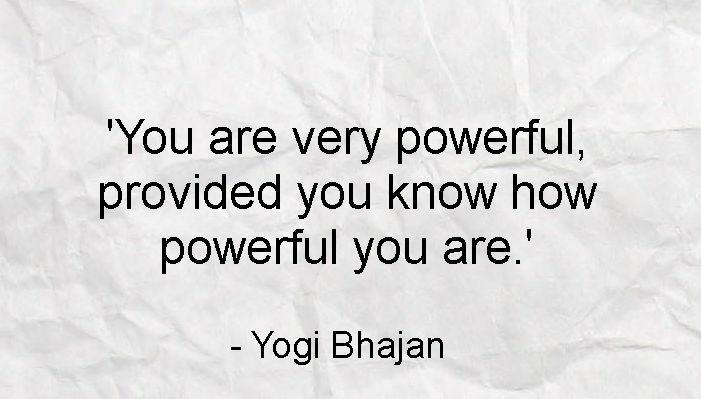 I read this little gem of a quote from Yogi Bhajan recently and it occurred to me to share it with you guys in the spirit of Self-Love September. Today I urge you to get clear on how much power you have to make positive changes and design your life in accordance with your own vision. When people finally reach a point of willingly inviting self-love, it's such an immense show of power! The good kind of power - the power which should be utterly celebrated. It is a beautiful choice and it leads to beautiful things. Sometimes, recognising your power and recognising your divinity are the same thing. Witness the life force which runs through you and honour your involvement in this holy web called cosmos. You come from the same infinite power source as the rain forests, the thunderstorms, the lion prides and the hundred year old oak trees. You are not divorced from the majesty of divinity. You can channel that life force and use it to make things happen. But first you must see it, honour it, trust it. I plan to share some other quotes which really inspire me to love, respect and honour myself, so watch this space!